Arthropoda, Tardigrada and Onychophora evolved from lobopodians, a paraphyletic group of disparate Palaeozoic vermiform animals with soft legs. Although the morphological diversity that this group encompasses likely illustrates the importance of niche diversification in the early radiation of panarthropods, the ecology of lobopodians remains poorly characterized. 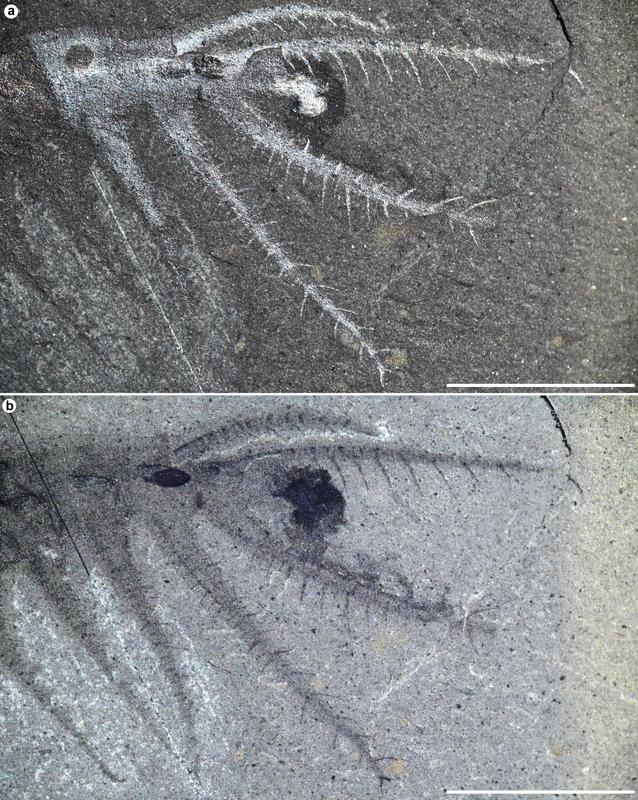 Here we describe a new luolishaniid taxon from the middle Cambrian Burgess Shale (Walcott Quarry) in British Columbia, Canada, whose specialized morphology epitomizes the suspension-feeding ecology of this clade, and is convergent with some modern marine animals, such as caprellid crustaceans. This species possesses two long pairs and four shorter pairs of elongate spinose lobopods at the front, each bearing two slender claws, and three pairs of stout lobopods bearing single, strong, hook-like anterior-facing claws at the back. The trunk is remarkably bare, widening rearwards, and, at the front, extends beyond the first pair of lobopods into a small “head” bearing a pair of visual organs and a short proboscis with numerous teeth. Based on a critical reappraisal of character coding in lobopodians and using Bayesian and parsimony-based tree searches, two alternative scenarios for early panarthropod evolution are retrieved. In both cases, hallucigeniids and luolishaniids are found to be extinct radiative stem group panarthropods, in contrast to previous analyses supporting a position of hallucigeniids as part of total-group Onychophora. Our Bayesian topology finds luolishaniids and hallucigeniids to form two successive clades at the base of Panarthropoda. Disparity analyses suggest that luolishaniids, hallucigeniids and total-group Onychophora each occupy a distinct region of morphospace. Hallucigeniids and luolishaniids were comparably diverse and successful, representing two major lobopodian clades in the early Palaeozoic, and both evolved body plans adapted to different forms of suspension feeding. A Bayesian approach to cladistics supports the view that a semi-sessile, suspension-feeding lifestyle characterized the origin and rise of Panarthropoda from cycloneuralian body plans. Lobopodians are known from more than 30 species preserved in various Palaeozoic fossil Lagerstätten across the globe , with the best preserved material coming from Cambrian Burgess Shale-type deposits in China and Canada [2–7]. Lobopodians were common members of many Cambrian benthic communities globally; many skeletal elements also occur as isolated carbonaceous and phosphatic microfossils in many other types of deposits . Interpretations of their ecological roles, however, have long remained marginal to studies of their morphology. While the discovery of different lobopodian body plans suggest different lifestyles , it is only recently that an attempt has been made to quantify the degrees of morphological and ecological disparity displayed by these organisms . This work has led to the suggestion that the luolishaniids, a group distinguished notably by pronounced antero-posterior limb differentiation [7, 9], was significantly more disparate than extant onychophorans and occupied a unique morpho-functional niche among their relatives . Following recent research on the morphology of Hallucigenia , this study  primarily relied on the armoured Collinsium  and Luolishania  to hypothesize that luolishaniids were stem-group onychophorans characterized by a specialization in suspension feeding. This view of the early evolution of panarthropods was in need of both additional morphological evidence related to suspension feeding in these fossils and of a cross-validation of the phylogenetic results put forward by the authors , who, notably, supported tardigrades as a sister group to a total-group Euarthropoda (forming a Tactopoda clade). 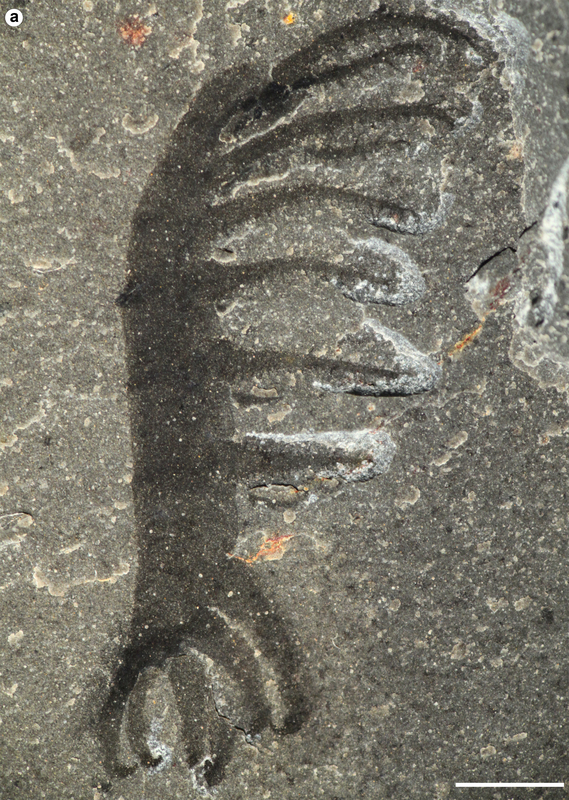 The new luolishaniid lobopodian described here from the Burgess Shale (Walcott Quarry) was first reported along with two other forms at a conference in 2001 . One of these other forms is the “Collins monster” [11–14] from the Burgess Shale’s Tulip Beds (“Undet Lobopodian TB-A” in ), a species that, despite the lack of formal description and details about its morphology, has repeatedly been discussed and incorporated in a number of phylogenetic analyses, including those of Yang et al. . 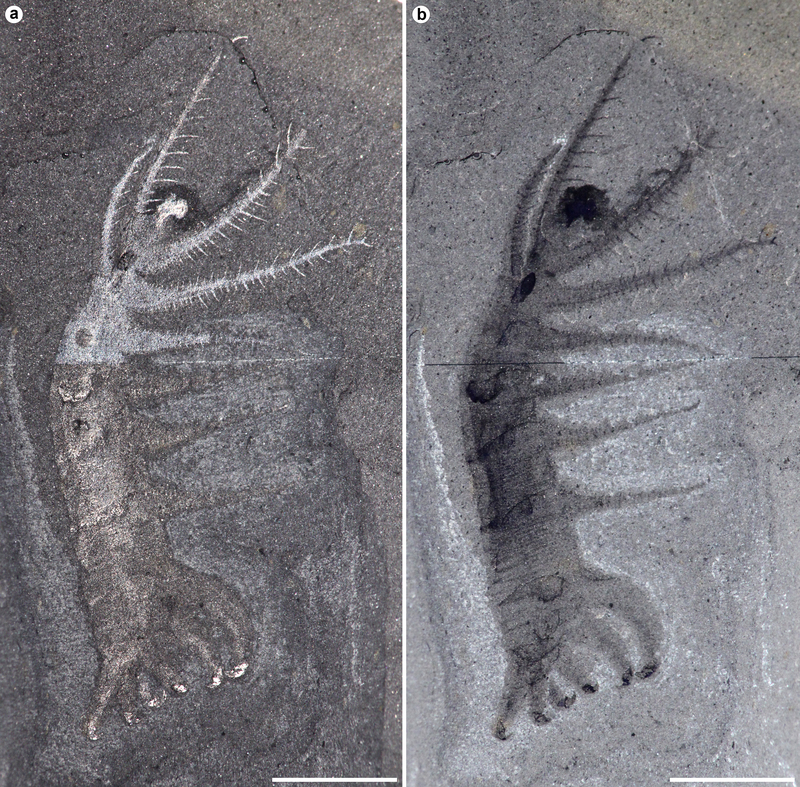 The new species described here represents only the third lobopodian to be formally described from the Burgess Shale after Hallucigenia sparsa [4, 16] and Aysheaia pedunculata , which were first reported in 1911 . With only two specimens discovered to date, it is also one of the rarest species from the Burgess Shale community. 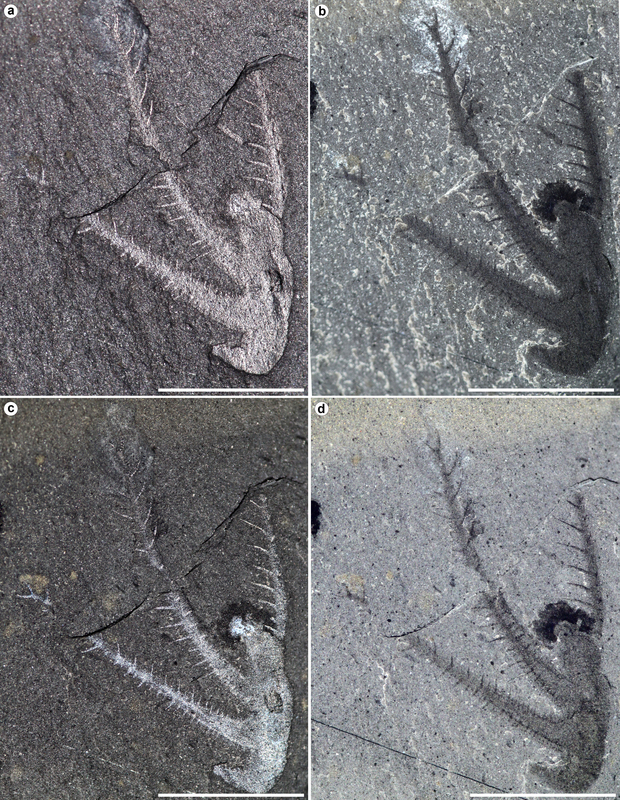 The specimens were studied in a manner similar to other Burgess Shale specimens (e.g. ): they were prepared using light mechanical tools to remove matrix coating some body elements, observed using a stereomicroscope, and photographed under different lighting conditions, including interference lighting (see Additional files 1, 2, 3, 4, 5, 6, 7, 8 and 9). 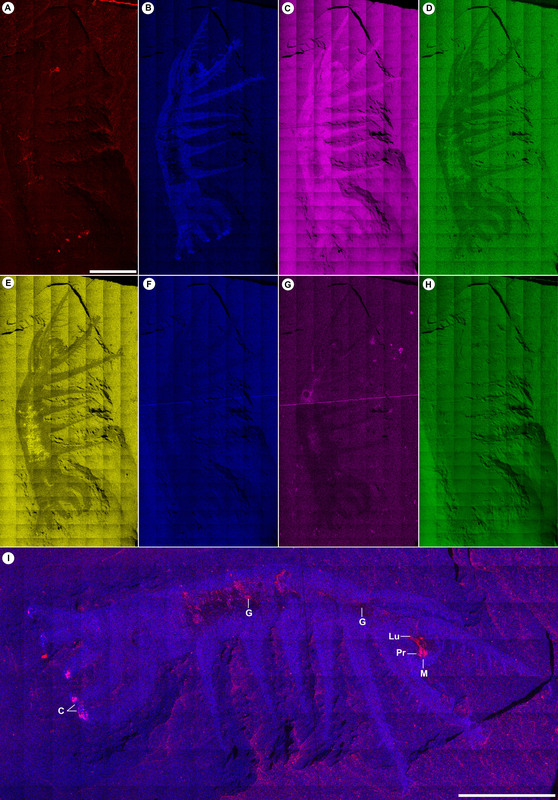 The holotype specimen was also observed using a scanning electron microscope (FEI Quanta 200 Field Emission Gun), uncoated and operated under low or high vacuum conditions between 10.0 kV and 20.0 kV, to obtain secondary electron or backscattered images and elemental maps. Elemental maps were collected using an EDAX energy dispersive spectroscopy (EDS) X-ray detector under low vacuum (70 KPa). Phylogenetic treatment. Cladograms were produced using MrBayes v. 3.2.6  and PAUP* v.4.0a150  based on a dataset of 59 characters and 38 taxa. The Bayesian analyses used the Mkv method recommended by Lewis for morphological data  (i.e., with the assumption that all observed characters are variable with equal transition rates between states). Trees were generated during two parallel runs of 10,000,000 generations (four chains) with a tree sampled every 1000 generation and burn-in of 20%. Estimation of variation in among-character rates was set to follow a gamma distribution. The parsimony analysis consisted in a heuristic search with tree bisection reconnection, for which we constrained a limit of 10 trees of scores ≥ 1 for each of the 1000 replicates. All characters remained unweighted and unordered in all analyses and inapplicable entries were treated as uncertainties (see Additional files 10, 11 and 12 for further methodological details, and datasets). Disparity analysis. The morphospace analysis follows the method we used in a previous study . Sums of ranges were jackknifed for each group using 5000 iterations, from which permutation statistics were calculated as well as their corresponding p-values (following, e.g., ). The R package hypervolume was used to generate volume data based on kernel density estimates of the Euclidean coordinates on the first four principal coordinate analysis (PCoA) axes (the four significant factors of variation under a Broken Stick model), and overlap was tested using the Sorensen-Dice index ; this method to test the inclusion of points in a specific hypervolume is also provided with the hypervolume package. Additional R packages, namely, cluster, scatterplot3d, vcd, and vioplot, were used to produce graphics. The tree search and morphospace use different datasets (see Additional file 10 for further information). Type genus and species. Hallucigenia sparsa Walcott 1911 . Diagnosis (revised from references [16, 26]): Lobopodian panarthropods characterized by long, tubular and smooth lobopods, but commonly adorned with well-developed pairs of plates or spines dorso-laterally on the trunk. Members of this family characteristically exhibit a small ovoid or large bulbous head followed, respectively, by an elongate or short “neck” bearing two pairs of non-annulated, flexible anterior tentacle-like limbs that are thinner than trunk lobopods and do not bear any spinules or claws. H. sparsa and H. hongmeia, from the early Cambrian Stage 4 Guanshan fossil Lagerstätte , Cardiodictyon catenulum [26, 28] and H. fortis [12, 26] from the early Cambrian (Stage 3) Chengjiang Biota (Maotianshan Shale Member, Yu’anshan Formation), and Carbotubulus waloszeki from the Middle Pennsylvanian Carboniferous of Illinois . The inclusion of Microdictyon sinicum  (and other related species from various localities—e.g. ) within the hallucigeniidae is supported by our Bayesian topology but not by parsimony (see below). Microdictyon is otherwise found to conform to the hallucigeniid body plan by our disparity analysis. Since tentacles are absent in this taxon, we keep it outside Hallucigeniidae, but the “elongate” condition of its head similar to H. sparsa and Carbotubulus may require further discussion and the creation of a more inclusive hallucigeniid clade. Type genus and species. Luolishania longicruris Hou and Chen, 1989 . Diagnosis (emended from ): Lobopodian panarthropods with anteriormost five or six lobopod pairs adorned with double rows of 20–30 spinules arranged in a chevron-shaped pattern along the ventral side; body tagmatization includes both anteriorward and posteriorward gradual reduction in lobopod interspace, with posterior tagmatization always involving more than two limb pairs; when dorso-lateral spines are present, they are complemented by at least a third, median row of spines [see also Additional file 10]. Ovatiovermis (infra), Collinsium ciliosum  from the early Cambrian (Stage 3) of China, an unnamed species from the early Cambrian (Stage 4) of Australia , Acinocricus stichus [12, 34] from the middle Cambrian (Stage 5) of the USA. The “Collins monster” [11, 12] and another unpublished form  from the Burgess Shale are currently being described by the authors and were not included in this paper; their affinities within luolishaniids, e.g. , require further investigation. In both Bayesian and parsimony topologies, Facivermis yunnanicus Hou and Chen is found to be part of the luolishaniid clade, owing to the presence in this taxon of the diagnostic double-row of spinules on its anterior—and only—limbs. The lack of posterior limbs could be either plesio- or autapomorphic; as it stands, Facivermis may be later included in a more inclusive luolishaniid clade. Ovatiovermis cribratus gen. et sp. nov.
Ovatiovermis is from the Latin ovatio (ovation) and vermis (worm) owing to the inferred upward-reaching, limb-waving posture of these animals; cribratus is from the Latin cribrare, to sieve. Holotype ROM (Royal Ontario Museum) 52707, part (Figs. 1a–e, i–j; 2a–c, e–k, p; Additional files 1, 2, 4, 5, 6 and 7) and partial counterpart (Figs. 1h, g; 2d, l, n, o; Additional files 3 and 8), Paratype ROM 64006 (Additional file 9). Walcott Quarry on Fossil Ridge (Yoho National Park, British Columbia), Walcott Quarry Shale Member of the “Burgess Shale” Formation . The holotype specimen (ROM 52707) was collected from bed assemblage −120 (about 1.2 m below the base of the original Walcott Quarry floor), which is distinct from other bed assemblages in that it has particularly well-preserved specimens  across a range of taxa (N = 92 species) . The paratype specimen (ROM 64006) comes from talus material originating from the Walcott Quarry. Ovatiovermis differs from other luolishaniid lobopodians in possessing an unadorned trunk with the first two anteriormost limb pairs 1.5 times longer than lobopods of the midsection and a trunk width doubling posteriorly, ending in three pairs of increasingly shorter and very stout unadorned lobopods, each terminating in a single strongly sclerotized curved claw facing anteromesially.
. 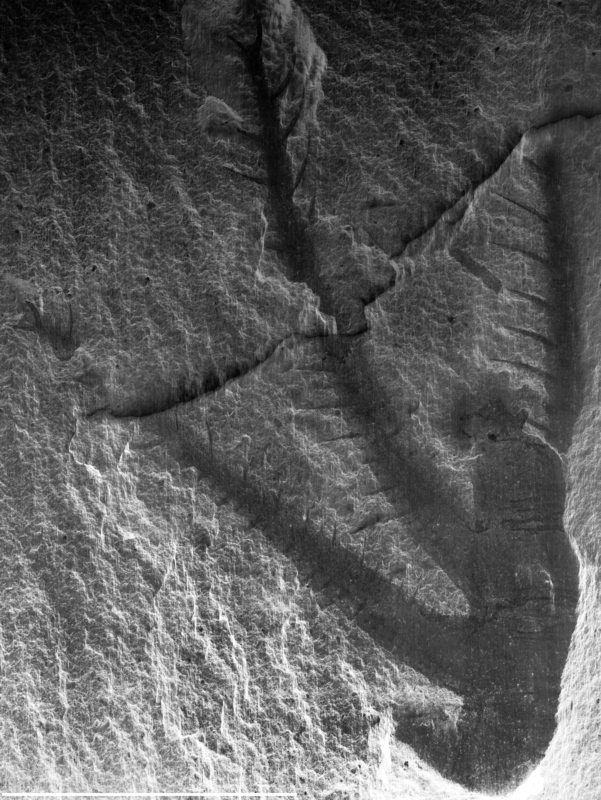 It shows a variable number of fine epidermal annuli (c. 10 annuli/mm) between limb pairs (Fig. 2a; Additional files 2, 4 and 7). The section before the first limb pairs, interpreted here as the “head,” is small (c. 10% of total trunk length) and bears a pair of dorsal ovoid structures about 100 μm in length (Figs. 1h and 2h, k–n) interpreted as visual organs, likely ocellar—no evidence of more complex eye structures like in Luolishania and other forms  is preserved. A darker axial structure rich in carbon (Fig. 1c–d; Additional file 6) starting from the distal end of the head and running to at least two-thirds of the way through the trunk is interpreted as a short bulbous proboscis with a terminal mouth followed by a foregut with a distinct lumen (Fig. 2h). A dark stain around the head (Fig. 1b, g–i; Additional files 1, 2 and 3) probably represents decay fluids of internal tissues seeping out of the mouth. The proboscis bears dozens of tooth-like elements (Fig. 2i–j), each c. 20 μm in length, with no evidence of such elements present in the foregut. Small carbonaceous spots of various shapes and sizes further back along the trunk along a confined axial zone probably represent gut remains. These are more obvious along folded areas (e.g. Fig. 2f, g), especially above the insertion points of the opposite limb pairs. Like in Luolishania , a pair of conspicuous darker strips c. 0.2 mm in width is evident within the first two pairs of lobopods (Fig. 1g; Additional files 3 and 5). These seem to be linked to the basis of the spinules and possibly represent internal structures such as neural tissues or blood vessels. Three types of lobopods can be identified (Figs. 1 and 2). The first two pairs of lobopods are the longest (c. 9.7 mm and c. 9 mm respectively), followed by the 3rd to 6th pairs (average 5.6 mm), and 7th to 9th pairs (from c. 5.3 mm to c. 3.5 mm for the last pair). The first six pairs are elongate, broad at the base (c. 1.2 − 1.4 mm) and quickly narrowing towards the tip (the base of a narrow elongate claw), whereas the last three pairs have a wide base (decreasing from 1.5 to 1 mm at the back) and narrow only slightly towards the tip. The distance between pairs of lobopods seems constant between pairs 1 to 5, and increases between pairs 5 and 6 (c 1.2 mm), and 6 and 7 (c. 2 mm). The distance between each of the last three pairs of lobopods, however, is much smaller (c. 0.3 mm). Twenty to thirty pairs of spinules are present on the first two pairs of lobopods (Fig. 1i, j), varying in length and thickness, possibly due in part to variations in the angle of burial and minor rotations of the lobopods, the longest being c. 1 mm long and 0.1 mm thick. While spinules are present along the entire length of the lobopods, the longest spinules tend to be positioned distally. Spinules are much more diffuse and shorter along the 3rd to 6th pairs of lobopods, and there is no evidence of spinules on the last three pairs of lobopods. Spinules are inserted medially along the ventral surfaces of the lobopods (Fig. 2o), roughly 0.2 mm apart and arranged in a V (chevron) shape, forming a roughly 100° angle. A pair of elongate (c. 1 mm long and c. 0.1 mm thick) and slightly curved claws is present at the end of each of the first two pairs of lobopods (Figs. 1j and 2d), and possibly the following four pairs as well, although they are not well preserved. The last three pairs of lobopods have strongly curved (c. 150°) claws c. 1 mm in length (Figs. 1e and 2a, b, e). These claws have a broad base (Fig. 2a) which is poorly sclerotized compared to the tips (Fig. 2e), and might represent an internal support to the claw. The claws narrows to a smooth tip, and contain two stacked elements (Fig. 2e) similar to those in Hallucigenia . 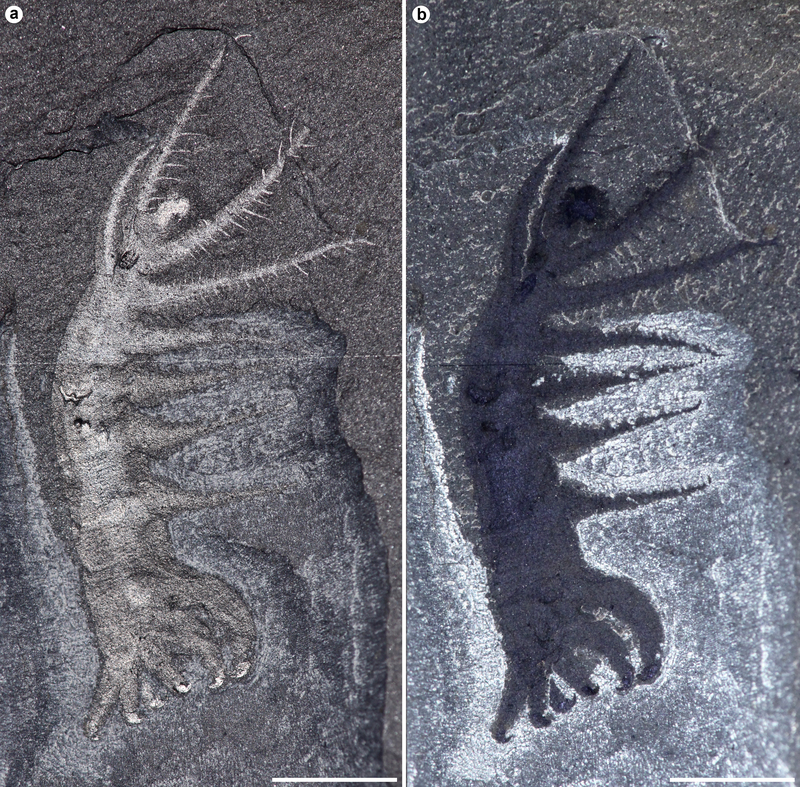 Also similar to the last two pairs of claws in Hallucigenia  and Collinsium (Fig. 2c in ), the last three pairs of claws in O. cribratus point towards the front. The Bayesian consensus favours a basalmost monophyletic Luolishaniidae and a derived monophyletic Hallucigeniidae as sister-group to the remaining panarthropods, with tardigrades and onychophorans forming a grade to Arthropoda. The position of hallucigeniids, luolishaniids and Onychodictyon taxa relative to each other is not strongly supported, however, showing that basal relationships between “long-legged” forms (see ) is still difficult to resolve. In contrast, parsimony resolves onychophoran-like taxa as a basalmost grade, with tardigrades as sister group to a monophyletic Hallucigeniidae + Luolishaniidae, itself sister clade to “kerygmachelids” + Arthropoda—a Tactopoda configuration sensu . The result under parsimony is strongly influenced by the polarization of integumental differentiations. While the paraphyly of lobopodians was also found in previous studies [3, 4, 9], neither of the two topologies corroborates findings of a monophyletic “total onychophoran group” including hallucigeniids and luolishaniids as retrieved from a recent dataset ([3, 9]; see Additional file 10). The “cone-in-cone” sclerite, a character presented as critical in grouping hallucigeniids and onychophorans , is here optimized as plesiomorphic due to uncertain coding in most of the relevant taxa. The grouping of Aysheaia with tardigrades is an illuminating new result for the origin and evolutionary significance of this group, as is its position relative to luolishaniids and hallucigeniids under parsimony. Aysheaia displays multiple juxtaposed claws at the tips of their lobopods that could constitute a possible apomorphy of the group. Modern tardigrades have lost large intermediate regions of their body axis , hampering otherwise a straightforward relationship with fossils based on external anatomy. Nonetheless, our study puts emphasis on typical tardigrade characters that, along with onychophoran ones (e.g. annulation, lobopods, ocular appendages), have shaped early panarthropod evolution, namely, the posterior body termination characterized by truncation, and forward-facing claws. These traits have been present throughout the stem Panarthropoda, with, as we discuss below, potentially important ecological implications. On the other hand, our phylogenetic results do not permit to conclude on whether the dorsal and ventral plates of heterotardigrades relate to either lobopodian sclerites or arthropod tergo-sternites . Likewise, the presence of a ganglionic ventral nerve cord (, the only sound synapomorphy of Tactopoda in ), while indeed a strong argument to bring tardigrades closer to arthropods, is not incompatible with a reversal in onychophorans from a likelihood perspective. As a result, we think that the Tactopoda concept  is not well supported from a morphological point of view. Molecular analyses likewise disagree (e.g. [42, 43]), and it is striking that Tactopoda sensu  is never retrieved. The fact that our Bayesian topology (similar to ) does not find tardigrades to be close to euarthropods, but that our parsimony-based topology does, could therefore ultimately reflect a methodological conflict. As mentioned above, however, this issue is not surprising given the highly derived condition of tardigrades. Apart from the Tactopoda versus Onychophora + Arthropod controversy, the main discrepancy between the two topologies lies within the morpho-functional interpretation for the origin and earliest radiation of Panarthropoda. While parsimony favours a secondarily-derived morphological condition based on suspension-feeding for luolishaniids and hallucigeniids with an ancestral “crawling” body plan, a Bayesian approach on the opposite supports the hypothesis that a semi-sessile and suspension-feeding lifestyle might have been the ancestral condition of all panarthropods. Considering growing evidence that a Bayesian approach to discrete morphological matrices generally outperforms parsimony ([44, 45]), as well as the fact that our Bayesian topology is more resilient to changes than our parsimony-based one and a greater overall credibility in the position of onychophorans relative to arthropods, we choose here to present the Bayesian cladogram as our main result and the parsimony as secondary (Additional file 10: Figure S1).
. The phylogeny-based groups are quasi non-overlapping over the first four dimensions of the PCoA (Sorensen indices > 0.06 in all cases). In addition, based on hypervolume calculations (Fig. 5c), the centroids of all three groups are nearly equidistant (Euclidean distance: L-H = 0.52; H-O = 0.52; L-O = 0.65). A neighbour-joining analysis finds, however, that hallucigeniids cluster with luolishaniids (Fig. 5b). Likewise, a k-means clustering is found to be significant for two groups at four dimensions, one of which is composed of hallucigeniid and luolishaniid taxa. Hallucigeniids occupy a greater hypervolume of morphospace than both onychophoran-like taxa and luolishaniids (Fig. 5e), while luolishaniids and hallucigeniids both encompass a relatively larger disparity based on sums of ranges than onychophoran-like taxa (Fig. 5d). The sums of ranges between hallucigenids and luolishaniids are not statistically different based on the simulated data (Additional file 10). The hallucigeniid and luolishaniid clusters are therefore more “stretched” along some axes (as is evident, e.g., on axis 1, Fig. 5a, c), while the hallucigeniid cluster is also larger overall (Fig. 5c, e, Additional file 10). Therefore, based on current palaeontological evidence, there is no indication that luolishaniids displayed a significantly greater level of disparity than hallucigeniids, and did not encompass a greater volume of morphospace than total-group Onychophora, providing an appropriate dissimilarity index is used and missing-data-rich outliers are removed (see Additional file 10 for discussion). Notwithstanding, the shape of the hallucigeniid cluster could be somewhat distorted by the less well-known Carbotubulus, which lies outside of the hallucigeniid cluster based on neighbour-joining. Moreover, the exclusion of Diania and Xenusion from the “onychophoran” cluster based on paraphyly is clearly amputating the “bottom-dwelling” early lobopodian body plan from a portion of its achieved morphological diversity. Owing to the scarcity of the data, it is therefore difficult to conclude that the body plan represented by total-group Onychophora has been drastically less successful (if less spectacular) in occupying morphospace than hallucigeniids and luolishaniids. Certainly, a profound change in ecological niche could have been responsible for the observed differences in disparity: indeed, adaptive opportunities might have been greater for substrate-attached suspension-feeders in Cambrian seas compared to more cryptic bottom-dwellers. Nonetheless, these three groups seem to have similarly explored their own regions of morphospace, with variations involving different parts of their anatomy, although perhaps not over the same time scale. Even if our analysis is somewhat conservative in that a number of autapomorphic features of either Tardigrada or Onychophora (such as the slime papillae or the internalized jaws) were not coded originally for the phylogenetic analysis and thus were not used for the computation of disparity, the addition of these autapomorphies to the matrix does not change our disparity results (see Additional file 10 for discussion). Following graphical observations and the phenogram obtained by neighbour joining (Fig. 5b), inclusion tests also find that Microdictyon and Onychodictyon gracilis belong to the hallucigeniid morphospace, and that Onychodictyon ferox belongs to the luolishaniiid morphospace. Despite displaying more intermediate anatomies, as phylogenies suggest, these taxa have nonetheless clear morphological affinities that do not constitute exploration of non-occupied morphospace between the main groups of interest. This implies that the niches occupied by luolishaniids and hallucigeniids were truly distinct and as such able to drive specific morphological differentiations. The ecological nature of this difference is for now unclear (see below). Morphological specializations in O. cribratus indicate that this animal was most likely well adapted to a sedentary epifaunal, suspension-feeding lifestyle, its habitus being remarkably analogous to that of the Caprellidae, a family of highly specialized amphipods (Crustacea) . The presence of single strong curved claws borne by differentiated, stout lobopods at the back and long spinules at the front evinces that this species, like other luolishaniids [7, 9, 33], was better adapted to anchoring itself on hard substrates than walking on seafloors. Such a feature, strikingly convergent with the three last pereopod pairs of caprellids (whose posterior claws are also stout and turned forward), would have allowed for the anterior portion of the body to be erected in the water column. Outside of the luolishaniids, other lobopodians including Onychodictyon, Hallucigenia (fig. 2d and extended data fig. 7 in ) and Microdictyon all share the characters of posterior anterior-facing claws (not only O. ferox, as in ; see also ) and a truncation of the posterior end of the body (contra previous interpretations [7, 9, 47] see discussion above and in Additional file 10). This suggests that other lobopodians had evolved some form of posterior differentiation possibly involving the erection of the body. The retention of the anterior-directed claw morphology, but not of single pairs of stout claws in tardigrades was accompanied by miniaturization and other arguably progenetic transformations [38–40] leading to changes in ecology , though it is still associated with the grasping of substrates . We construe that such posterior differentiation evolved in concert with the transformation of anterior appendages into collecting and/or filtering apparatuses (Additional files 13 and 14). This is similar to what has been proposed for Luolishania  and Collinsium  where all the elongate and spinose lobopods might have formed a sieving device. 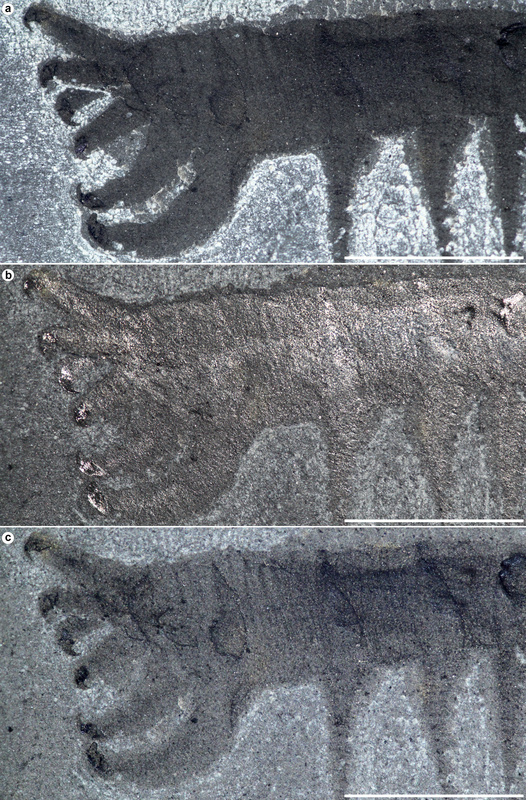 Such a device was also probably present in the “Collins monster,” another species from the Burgess Shale , Acinocricus  and an unnamed form from Emu Bay . In O. cribratus, the six pairs of spinous lobopods would probably have been able to rotate in various orientations, similar to Luolishania , indicated by the fact that the six pairs are spread out with the first and sixth pairs forming a 90° angle and, like the rest of the body, which shows soft-deformations, were evidently flexible. Assuming such flexibility, the mouth would have been able to reach food particles gathered closer to the body axis by each of the spinulose lobopods, its toothed proboscis functioning similarly to that of priapulid worms . Likewise, caprellids use setae present on their second antenna for suspension feeding ; the greater the setation, the greater the effectiveness in suspension feeding , although more recent studies show that a wide range of feeding behaviors are possible and that most caprellids, including many with setae, are considered—at least partially—to be detritivores . Accordingly, it is conceivable that O. cribratus might have occasionally fed on deposited particles, even though body plan adaptations point to a primarily obligate sessile, suspension-feeding lifestyle. Compared with other luolishaniids, the few anchoring lobopods in O. cribratus and the presence of only two more elongate pairs anteriorly represent both a simplification and further specialization of known morphologies. While anterior and posterior ends of the body in the luolishaniid from Emu Bay Shale remain unknown , Collinsium  is much more elongate, with possibly up to nine non-setose limb pairs forming the anchoring portion of the body—at the very least, appendage pairs 12 to 15, though the morphology of the limbs in the mid-section is less clear. The contrast is even stronger with Luolishania, whose limb differentiation is very gradual throughout. Our cladograms suggest that the condition in O. cribratus is derived. Assuming a sieving function of the spinulose appendages, the size of food particles caught— less than 0.2 mm— would be consistent with micro- to meso-nektobenthic prey items in the water column  and less likely to be phytoplankton, since the distance between spinules is much wider than the typically small (<75 μm diameter) acanthomorphs found in Cambrian deposits worldwide . In Collinsium, also interpreted as a suspension feeder , the distance between spinules (~0.15–0.25 mm) and length of the spinules (1.5–2.5 mm) are comparable to the EBS form and O. cribratus. Luolishania (Figure 9D in ) displays a preserved length of spinules ~0.15 mm, and notwithstanding taphonomic error , significantly shorter than that of other luolishaniids, although the distance between spinules of 0.15 mm is comparable with other forms. This shows that different luolishaniids were likely capable of preying on similar types of prey items. Sizewise, hallucigeniids and luolishaniids can be moderately large (Acinocricus could reach ca. 10 cm), but they are small enough to live on the surrounding substrates—e.g. sponges; by comparison, "kerygmachelids" are much larger (20 cm or more). Whether the ancestor of panarthropods has more of a nematode or priapulid morphology remains difficult to resolve [57, 58] and the fossil record itself is ambiguous: while Paucipodia seems to be little more than a legged nematode, priapulid-like proboscides and palaeoscolecid-like nodes are found in other taxa, suggesting then that the hypothetical panarthropod ancestor combined different cycloneuralian morphologies. As such, the ancestral ecology is also not well constrained. A possible panarthropod transition form could be embodied by the (albeit poorly known) taxon Facivermis, from which endobenthic vermiforn panarthropods could have moved to epibenthic ecologies . As Steiner et al. noted , the posterior hooks of Cricoscomia are reminiscent of the strong claws of certain lobopodians, and in particular, of the stouter single posterior claws observed across the long-legged forms, which hints at their possible origin. Although not preserved in great detail, Carbotubulus  provides evidence that a typically hallucigeniid morphology—an elongate “head” bearing thin tentacular limbs—could be combined with a luolishaniid trait, namely the thickening of posteriormost lobopods. As such, this taxon strongly reinforces the possibility that both groups shared an epibenthic, suspension-feeding niche. Given our Bayesian tree, the absence of any scales or spines along the trunk of Ovatiovermis could be plesiomorphic, but we construe that dorso-lateral sclerites were more likely present in the common ancestor of luolishaniids and hallucigeniids (as opposed to having sclerites being convergent between these clades). The evolution of biomineralized elements, including skeletonized dorsal elements, in lobopodians is generally viewed as a direct response to the evolution of predators in Cambrian communities, e.g. [9, 59], and, in the case of Luolishania , and more particularly Collinsium, an argument has been made that the presence of spines was a direct consequence of the particular lifestyles of these animals more readily exposing them to predators  in presumably more open waters . Several Cambrian lobopodians, notwithstanding, lack dorsal spines or plates, including forms with short lobopods such as Aysheaia  and Antennacanthodia . This begs the question as to how, or if, these “naked” forms, especially the sessile or slow moving ones, adapted to the selective pressure of predation. Aysheaia pedunculata was interpreted to have used its claws to potentially cling to sponges, which have also been interpreted as a potential food source, since many specimens are found preserved associated with or close to sponge remains . It was further suggested that, because Aysheaia did not bear any spines on its body, it might have also lived in sponge colonies to avoid predators . A similar lifestyle could be inferred for O. cribratus, although the paucity of the material precludes the identification of in situ associations. Nonetheless, the bed assemblage from which this specimen comes contains numerous sponges, mostly Hazelia , which could have served as a substrate. As an alternative to physical barriers to predation, camouflage or mimicry have been proposed as potential mechanisms for Burgess Shale molluscs  and brachiopods . While protection by sponges, as imagined for Aysheaia , remains a possibility, and, setting aside a speedy retreat as a defensive action, such a strong morphological reversal could also mean that O. cribratus relied on colour-based dissuasiveness (Fig. 2b), a form of aposematism , and/or that it was potentially toxic or distasteful to predators. Although difficult to substantiate based on fossil material, and thus less discussed, Ovatiovermis further illustrates the fact that the Cambrian response of organisms to the arms race was not exclusively sclerotic or shelly. Our study evinces the importance of suspension feeding in the diversification of Cambrian faunas has recently been emphasized, in particular with respect to other panarthropods [9, 53, 63], widening our ecological perspective on fossil forms traditionally viewed as active predators or scavengers. Using a Bayesian approach to lobopodian relationships and revising the identity of the hallucigeniid body plan, we provide here evidence for the plesiomorphic condition of semi-sessile, suspension-feeding lifestyles in all Panarthropoda. This indirectly supports the view that primary producers and mesozooplankton must have been abundant in Cambrian communities. Acritarchs [54, 64] would have been actively preyed or filter-fed upon by the mesozooplankton [65, 66] and small macro-organisms [63, 67]. The mesozooplankton in turn would have been consumed by larger pelagic suspension feeders such as anomalocaridids  in the water column, and by other animals, such as luolishaniid and hallucigeniid lobopodians, in the benthos. Thus, not only was the presence of plankton a catalyst of morphological change, but it also precipitated the evolution of a modern style of feeding interaction and food web organization soon after the emergence of animals during the Cambrian period . We thank Sharon Lackie (University of Windsor) for elemental maps of specimens, Danielle Dufault for technical illustrations (Fig. 2), Lars Fields for 3D modeling and animations (Additional files 13 and 14), and Sara Scharf for editorial suggestions. We are also grateful to Steve C. Wang and Benjamin Blonder for their help with R coding and statistics. The holotype specimen was collected in 1994 under a Parks Canada Research and Collection permit issued to D. Collins from the Royal Ontario Museum. The paratype specimen was found in 2011 by a visitor on a guided hike to the Burgess Shale led by Thomas Maguire of the Burgess Shale Geoscience Foundation, guiding under a permit issued by Parks Canada. This is Royal Ontario Museum Burgess Shale project number 46. This research was supported by a Natural Sciences and Engineering Research Council Discovery Grant (#341944) to JBC, and fellowships from the University of Toronto (Department of Ecology and Evolutionary Biology) to CA. JBC initiated the research project, prepared and photographed the specimens and wrote initial drafts of the paper. CA carried out the phylogenetic and morphometric analyses, and both authors contributed to the interpretations, discussions and writing of the final version of this manuscript. All authors read and approved the final manuscript. Lars Fields (Additional files 13 and 14).